Coleraine Young Farmers’ Club concluded their winter programme with the club’s annual parents’ night and prizegiving in Portrush Town Hall at the end of March. YFCU vice president James Speers was welcomed along as guest speaker for the evening. Members entertained the audience with a selection of plays, public speaking, games and several choral pieces. 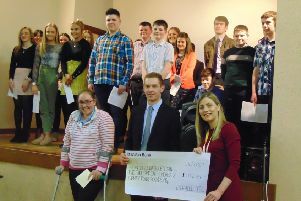 Coleraine Young Farmers’ Club would like to take this opportunity to pass on their thanks to the various judges and tutors who have given up their time throughout the year to ensure the club was kept on top of their game and to all the parents and friends of the club, whose ongoing support is second to none.